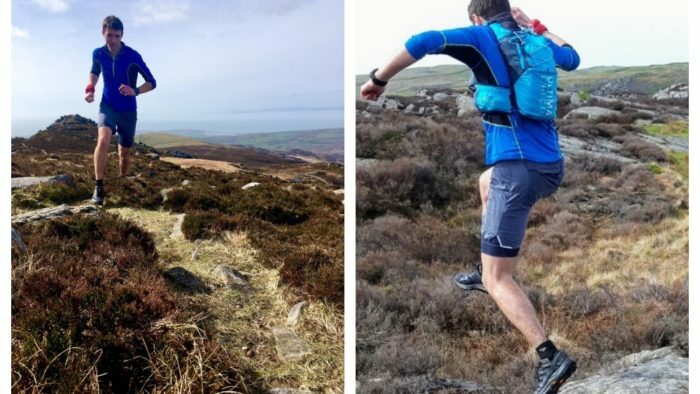 I’ve recently been trying to decide on which shoes to take for the 5 day Dragon’s Back Race in May, which covers a variety of terrain, so I jumped at the chance to test out the new Topo Ultraventures. These are aimed at trail and ultra runners who want the comfort of a more cushioned shoe but the more natural feel of a fairly low 5mm drop and an ‘anatomical’ toe box. 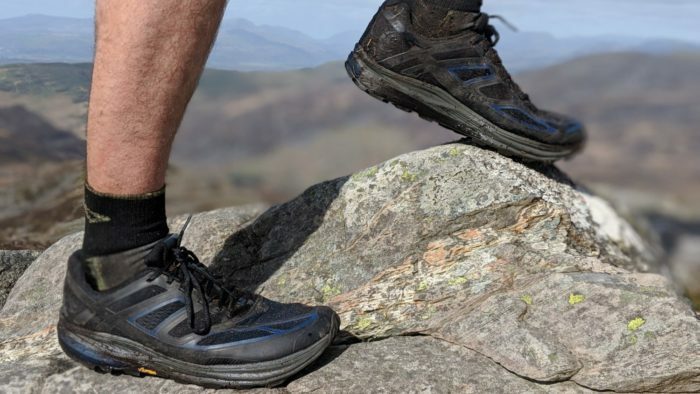 The Ultraventures also have a Vibram sole and a cushioned but breathable upper. 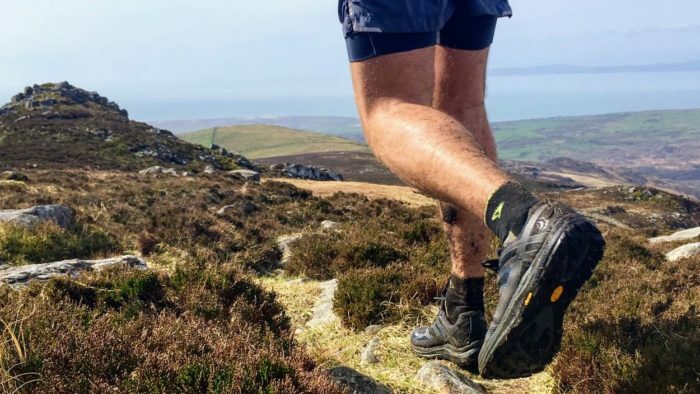 I’ve had the chance to give these shoes a good test, covering over 150 miles so far on a variety of terrains from road and hard trails, rocky scrambles and Welsh bogs! 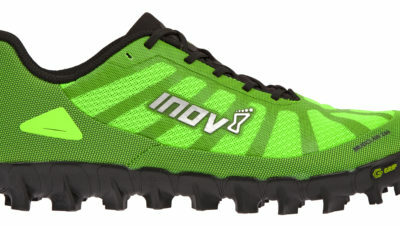 My initial impressions were that these are just as comfortable as the Terraventures. 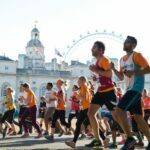 They are designed with a wide toe box which clearly suits those with wider feet but also those runners taking part in longer races where your feet tend to swell. Despite this space at the front of the foot, the shoe still feels secure around the middle of the foot and heel. 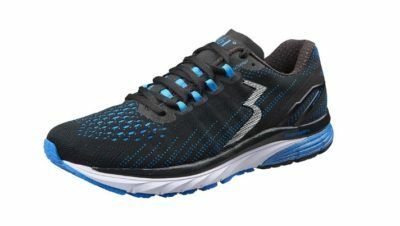 The cushioning around the heel does contribute to the comfortable feel of the shoe, but this does have the compromise that my foot moved around slightly within the shoe when running on rough ground. The uppers of the shoe are designed with drainage ‘gills’ which do allow the water to drain out fairly effectively but the cushioning does seem to stay wet for a while which means that the shoe is slower to dry. For the grip on the Ultraventures, Topo have used Vibram which has a good reputation for both grip and durability. I found the grip to be very effective on muddy trails but also comfortable on harder ground or road which is a useful compromise to achieve. I did find the limits of the grip after a couple of slips down a steep wet mountainside, but to be fair this isn’t the terrain these shoes are aimed at. If you’re sticking mostly to trails then this grip should do exactly what you need. 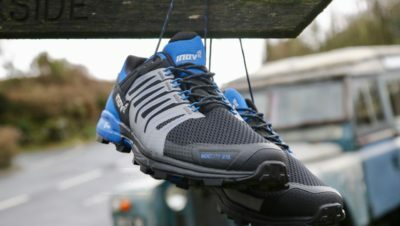 If you are looking for a comfortable shoe for covering long distances on the trails then this is one of the best I’ve tried. I’ve already made my decision that these will be one of the two pairs of shoes that I will be taking with me to the Dragon’s Back race in May and I can’t give them a much better compliment than that! Find out more about the full range of Topo shoes HERE.